Oh dear, they didn't really scan too well (because of the lumpiness I think!) - in real life they're more textural and less blurry than this! Don't have time for too much waffle tonight as I need to get some sleep before I go to work in the morning (work SO gets in the way sometimes! ), but I used acrylic paints with a crackle medium and walnut stain distress ink, a swirl of pearlescent glue, some tiny scraps of ribbon and a couple of glittered brads. 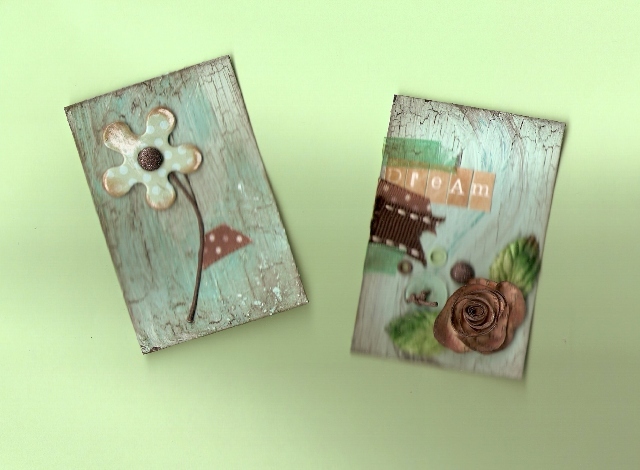 The flower on the left was a printed chipboard shape which I roughed up a bit and the spiral rose was made from an old book page coloured with distress inks and cosmic shimmer mist. Really will have to improve on my photography! Gorgeous - just as lovely as your rainsbow sherbert ones that I've just visited. I love the single flower - it's so effective, but I also love the rose on the other one - both are very lovely! great pieces, and your 2 rainbow sherbert ones too. Such cute little pieces of Art.. Well done..